When my husband and I were planning our wedding, one of the first things we decided was to serve fresh doughnuts from our favorite local bakery in place of a more traditional cake or cupcakes. We wanted a unique way to display them that would somehow incorporate the vintage and DIY elements that defined our wedding design. 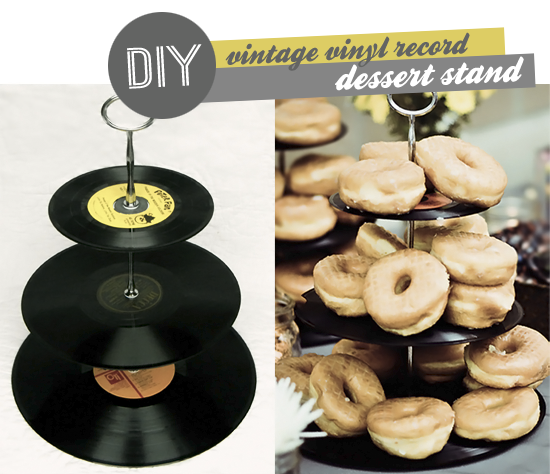 Thanks to the fact that we were both big fans of vinyl before we met, we share a very large record collection, and in the midst of a record listening marathon one afternoon, Robbie came up with the idea to make dessert stands from vintage records. It took some playing around to figure out the best parts to use, and a few trips to thrift stores to find the right sizes (neither of us were willing to sacrifice any records from our collection), but it ended up being a very easy and quick DIY project with a pretty awesome result. The holiday season brings lots of parties and opportunities to entertain, so I asked Robbie if he'd help me share this tutorial with my readers. In about 10 minutes - and for less than $10 - you can have a really cool way to display desserts for your guests at your next get-together! Before you begin, wash the records with soap and water, and gently wipe dry. Gather all of your supplies and find a comfy space. Since this is probably the least messy DIY project ever, there's no need for a fancy workspace. You can make it almost anywhere! To create the best ambiance, I suggest playing your favorite vinyl record while you're working (trust me, it makes everything better). Note: This project is easily adaptable. For the hardware, you can buy the pieces separately or order an inexpensive 3-tier cake stand center handle package (do a quick search on ebay; they're under $10). You can also look for an old cake stand at a thrift store and take it apart to use the pieces. Only have two sizes of records? No problem. Just make a 2-tier stand! 1. Attach 4 self-stick felt pads (found at most hardware or craft stores), evenly spaced, on the bottom of the largest record (33 1/3 rpm). These will act as "feet" to make the base of your stand more stable and give it a little height. In place of self-stick pads, you can also cut circles from a piece of felt and glue them on. 2. Pick up the screw, and place one metal washer onto the screw post, followed by one felt washer. (The metal washer is important for the large record because it helps distribute the weight to prevent the record from cracking). 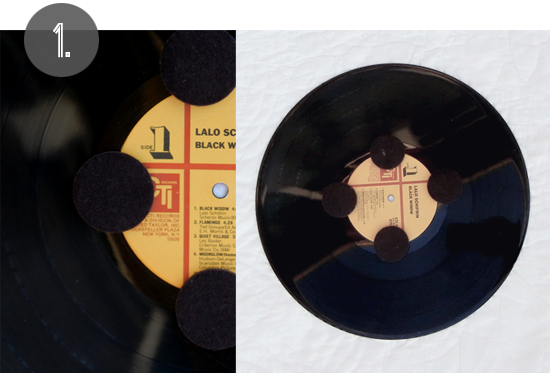 Put the screw though the hole of the largest (33 1/3 rpm) record from the bottom up so that the felt washer is closest to the bottom of the record. Place another felt washer over the screw so it's touching the top side of the record, and screw on one of the cake stand rods. 3. 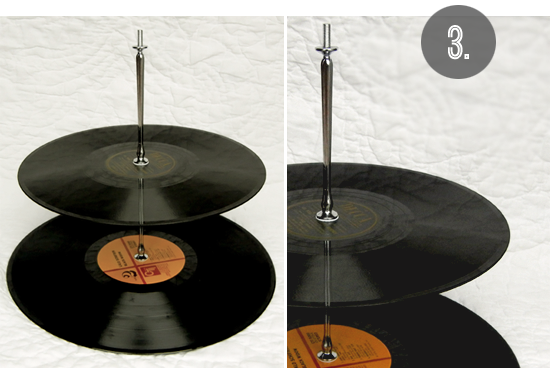 Place another felt washer on the screw post of the cake stand rod, and slide the medium size record (78 rpm) onto the post. Top this with another felt washer and screw on another of the cake stand rods. 4. Again, put a felt washer onto the screw post. 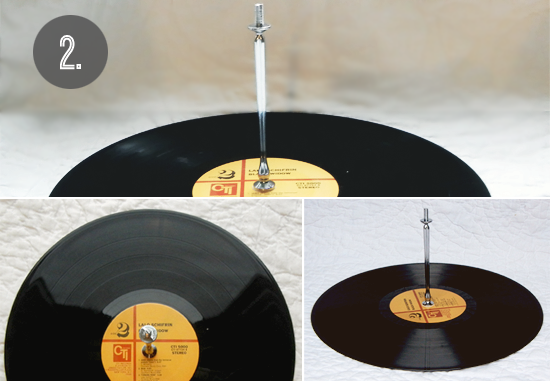 Place the small record (45 rpm) onto the post, and top with a felt washer. Screw in the top cake stand rod. (Note: You know those little adapters that have to be inserted in 45s so that they can play in standard record players? 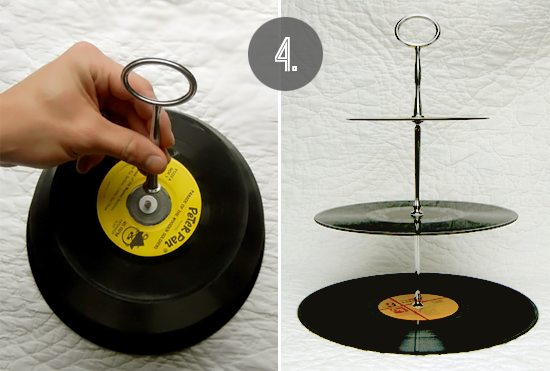 The same adapter is needed to make a 45 rpm record fit on the cake stand rod in this project. If there isn't already one in your record, you can buy a 10-pack for $3 almost anywhere that sells music). 5. Your stand is complete! Arrange doughnuts, cupcakes, or your favorite desserts on the different tiers. This stand can also be used for cheese and crackers, cut veggies, and other snacks. You can even use it as a table centerpiece for displaying non-food items. Big thanks to my rockstar husband for helping me to share this tutorial! This has officially become one of my all-time favorite DIY projects. It's easy, costs next to nothing, is eco-friendly (repurposing = awesome), and the final product is something really unique that can be used again and again. 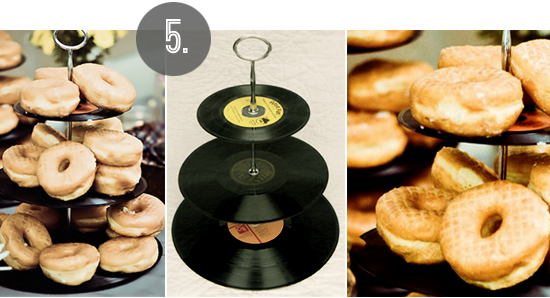 If you use this tutorial to make your own vinyl record dessert stand, be sure to send us some pictures! For more DIY projects and other goodness, make sure to follow us on Twitter, Pinterest, and Facebook. That is a super fun and original DIY - thanks for sharing!!! Wow! This is way cool! I'm gonna have to find some vinyl records so I can make one!!! This is freaking awesome!! I saw the stand on your wedding decor post & I think I said "eeep, want!" outloud then squirreled. Totally gonna make one this weekend! Such a great idea! My BF loves records & he'd totally love this look. This is fabulous!! Excellent post! This is so awesome!!! I found something sort of like this for $35, this one is way better and now I can make it for super cheap! Thank you!! i love that you made this for your wedding! and i love that u served donuts too, wedding cake is overratted! thanks for sharing the DIY! So cute! I love this idea!! Thank you for sharing! Brilliant. I love records and donuts, so this was really fun to read! where did you get the kit to make the tiers? Awesome! I love it when boys are handy. Such a wonderful, fresh idea, thank you for sharing!! i am so making one of these for the christmas party we are having this weekend. what a neat idea! I am putting this on my Pinterest. I LOVE THIS! This is one of the most original ideas I have seen in a long time! This is so fabulous. Adding this to my list of must makes. Visiting from Roadkill Rescue. PS I host a linky party every Friday-Sunday. I would so love it if you could stop by to link this, it is such a fantastic REDOUX! I can't find an inexpensive 3-tier cake stand center handle package. Does anyone have any ideas? I had seen a few folks selling the record stands on Etsy, but couldn't stomach paying $25+ for each one, so I'm glad I found this tutorial! Didn't realize how easy it could be. We're having a record theme for our wedding this summer, so I'm excited to add this to the decor! You can find them on ebay as well. Just search for "3-tier cake stand center handle package." Glad you all like this project! You can also make really nice bowls out of vinyl records. Thank you so much for this amazing idea. I bought some vinyl records at a second hand store for really cheap. You can find the 3-tier cake stand packages from ebay! They're pretty cheap, I just got a set of 5 for £7.99!! Yep, that is where we got ours for this project as well! Just do a search on ebay for "3-tier cake stand center handle package." 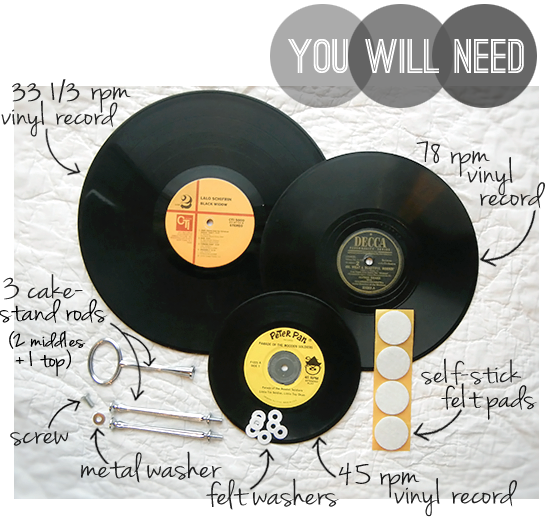 I LOVE your ideas and I plan on making one, but I have so much trouble finding the 45 rpm adapter...PLEASE HELP!!! Hello! You can find them at almost any store that sells music, or just do a Google search for "45 rpm adapter" and you'll find hundreds of places online that sell them. Amazon.com has 30 packs for $9.10 right now. Hope that helps! I did, it's fantastic!! thanks from France!! brilliant idea! i make dessert stands as well, out of vintage china. <3 it!!! Thank you for posting! LOVE THIS! I am definitely going to try and replicate it for my December wedding...I've been thinking of doing donuts and white castle cheeseburgers on cupcake towers for treats for the guests as they leave but this is soooo much cooler!! Question: How many donuts fit on this stand? I'm thinking I might need to make at least 2 each for the donuts and the burgers... Is there any way to make a 4-tier stand? (Not sure if there are record sizes bigger than 33 1/3... ??? My brother was a huge lover of vinyl and after he passed away I have a huge soft spot for vinyl. I am making this as soon as I get the cake stand piece from ebay! Thanks for this DIY, it made my day! Making these for my country vintage wedding =) Thanks for the easy inexpensive idea! Just made one following your instructions, i love it, so coool!! This is great, I am making them to raise money to be able to do community work in Costa Rica and Nicaragua !! This is absolutely amazing, and as a MOH is making me look extra impressive! Thanks!! Did you have any issues stabilizing it? I just got in my hardware last week and tried to put one together and it was kinda wobbly and the records could slide up and down a little bit. Any advice, or am I just doing it wrong? Hi Robin! We haven't had these issues with ours so I don't really have any advice unfortunately. Have you tried different records? Gorgeous idea! This bring me really great initiative for my job. Thanks. i'm using this idea for cupcake stands for my wedding this september! !